Welcome to your next stop on the RemARKables Blog Tour! 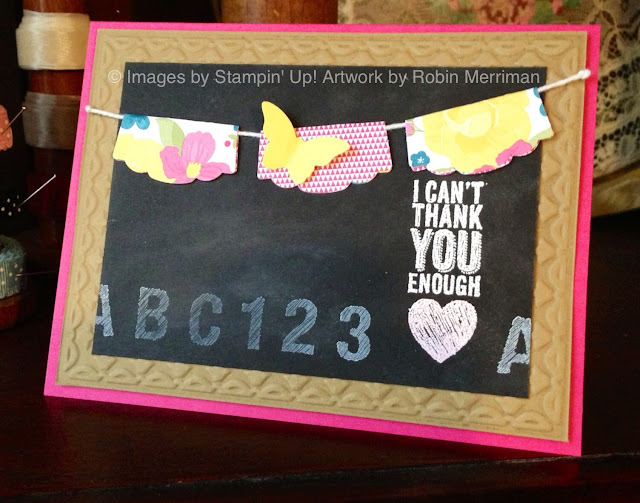 I love the chalkboard look that's so popular in stamping right now - and this seemed like the perfect stamp to combine with the new ABC-123 Sketch Alphabet stamp set for a teacher thank you card. My card base is Melon Mambo and the "chalkboard frame" layer is with Baked Brown Sugar. I used the Framed Tulips embossing folder to create the faux wood frame. The chalkboard layer is Basic Black and I mounted the letters and number on one block, stamping them with Whisper White Craft ink. The thank you image is stamped and embossed with White embossing powder. I made the little garland with the new Artisan Label Punch, punching the pieces out of the Gingham Garden Designer Paper. These were simply folded in half over a piece of White Baker's Twine that was adhered to the back of the Baked Brown Sugar cardstock. The butterfly was punched out of Daffodil Delight cardstock with the Bitty Butterfly punch and adhered with a glue dot. All in all, a very simple, yet very sweet card. Sneak Peek! RemARKabkes Best of 25 Blog Tour!